A beautiful area known for its mountains and hilltop towns. The Luberon area of France is part of the region of Provence, and in the département of the Vaucluse. It takes its name from the Massif du Luberon, a mountain range that actually consists of three ranges. Not nearly as tall as the Alps to the east, the Luberon's greatest elevation is 1,256 meters (4,121 feet). It is a very popular area for hiking and other outdoor activities. Much of the land is in the Parc Naturel Régional du Luberon. The Luberon achieved significant publicity in the early 1990s, due to the 1989 publication of Peter Mayle's first book, A Year in Provence. This clever book tells the story of buying and renovating a house in Ménerbes, a small town in the Luberon, and is peppered with anecdotes about house renovations, food, and life in Provence. Sequels include Toujours Provence and Encore Provence. At the western edge of the Luberon, just east of Avignon, is the town of L'Isle-sur-la-Sorgue, known for its antique and brocante market, as well as for its picturesque waterwheels. It's possible to base yourself in a hotel or apartment in one of the towns of the Luberon, and take day trips to visit some of the others. We used L'Isle-sur-la-Sorgue as a base and were able to visit quite a bit of the area. 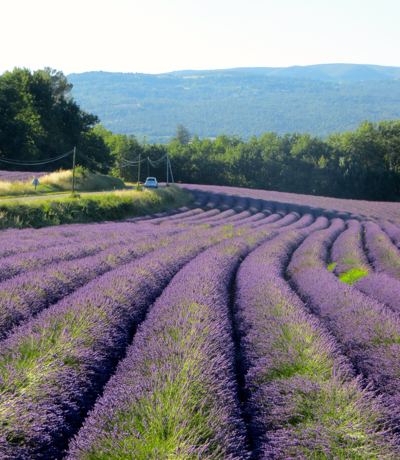 The Luberon offers a variety of both natural beauty and picturesque villages. It's also known for its many markets, including the Tuesday market in Gordes and the Sunday market in L'Isle-sur-la-Sorgue. 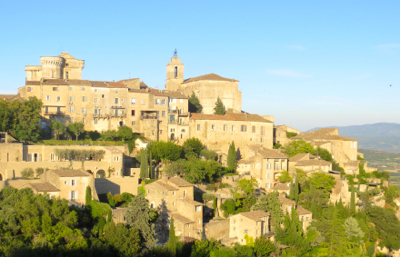 Gordes in the late afternoon sun. 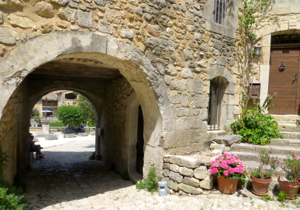 Above, Entrance to the medieval village of Oppède-le-Vieux.